We’ve come to the end of the LandCentral Investor Series. We taught you the ins and outs of land investing and even introduced you to our customized Investor Packs for every investing level. You should now have the confidence to create a successful real estate portfolio. 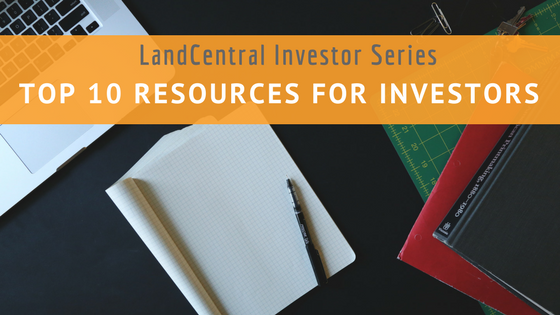 As promised, we’ll leave you with our Top 10 Resources for Investors. But don’t worry, we’re not going anywhere. No matter where you’re at in your investing needs, LandCentral will be here to help. Why Are Americans Investing in Vacant Land? Why is Raw Land Cheaper Than An Improved Lot? Is Land a Tangible, Low Risk Investment? Don’t forget to explore our Investor Packs. Properties stretch all over the country including: Arizona, Arkansas, California, Illinois, Florida, and many more. No matter what your investor level, these packs will have you investing like a pro in no time.